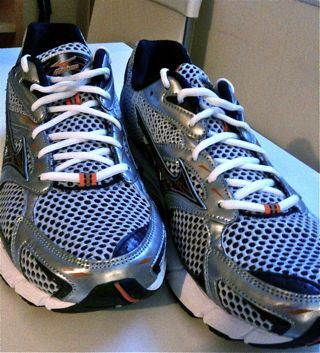 Today I bought new running shoes. I figured it was about time. I went into Moti on Whiteladies Road, because they seemed quite friendly the last time I went in, and they were great. I basically told them I was a beginner and threw myself on their mercy. Then I got to go on a treadmill for the first time, which was a bit odd. It took me a while to get the hang of it, but once I’d got my head around running without the rest of the world moving backwards, it was okay. And at least I didn’t fly off it into the shoe display at any point. After that, it was quite fun. Basically we watched video of me running on the treadmill (just my legs and feet, luckily! ), and he pointed out the angles that might be causing me a problem. Then he went to get four different sets of shoes that should each fix the problem, and I ran on the treadmill in all of them to see which were best. As well as checking them for comfort, we watched them all side‐by‐side on the video thingy after each bit of jogging, so he could make sure they were working okay for me. They were all pretty comfy. In the end I narrowed it down to a pair of Nikes or a pair of Mizunos, and finally chose the Mizunos because they were just a touch lighter. And I’m just back in from road‐testing them with Week 6, Run 1! That felt easier than last time, but I don’t know whether that’s because this was three separate runs (5 mins, 8 mins, 5 mins) or because of the shoes, which should be helping with my form, as well as feeling more cushioned. I did that ‘gait analysis’ in Frankfurt — hugely embarrassing as I’ve never really tried a treadmill before. ^_^; But the shop assistants assured me that my overpronating wasn’t as bad as I made it out to be and I walked out with a pair of Asics Gel Fortitudes. They are immensely comfy, although I haven’t put them through their paces yet!